The clothing trade was a very competitive business in the 19th Century. Stores advertised the latest styles and most up to date accessories in leaflets like this one, as well as advertising on the side of vans, on sandwich boards and in newspapers and magazines. 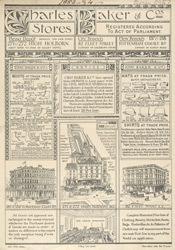 Using eye catching illustrations of the clothes or the store itself, leaflets, handbills and posters would have encouraged many to shop in stores like ‘Charles Baker & Co', featured on this leaflet.